The Research Institute for Sustainability Science and Technology under the Master degree in Sustainability Science and Technology organises the course Action Research Workshop on Science and Technology for Sustainability (5 ECTS). The purpose of the course is to put together civil society organisations, local administrations, students and educators to collaboratively undertake responsible research, using trandisciplinary Action-Research methodologies through service learning. 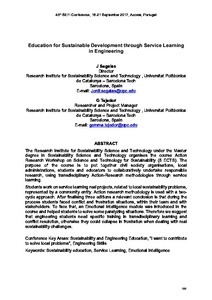 The research Institute for Sustainability Science and Technology under the Masterdegree in Sustainability Science and Technology organises the course Action Reserach Workshop on Science and Technology for Sustainability (5 ECTS). The purpose of the course is to put together civil society organisations, local administrations, students and educators to collaboratively undertake responsible research, using transdisciplinary Action-Research methodologies through service learning. Segalas, J., Tejedor, G. Education for Sustainable Development through Service Learninn in Engineering. A: Conference European Society for Engineering Education. "SEFI 2017: 48th Annual Conference: Azores, Portugal: September 18-21, 2017: proceedings book". Terceira - Açores: 2017, p. 186-193.